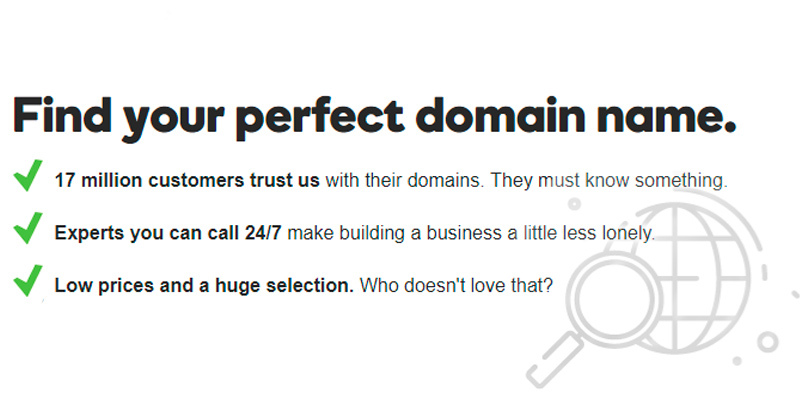 GoDaddy Find your perfect domain name. If you want a domain name registrar that won't just offer the most basic customs but provide you with an array of helpful additional features, GoDaddy is the kind of company that will definitely be capable of catching your attention. Namecheap offers its customers DNSSEC, Dynamic DNS, and Premium DNS at the price that you will be hard-pressed to find anywhere else. So instead of wasting your time and money on some other expensive and ineffective service, put your trust in Namecheap and the results will speak for themselves. 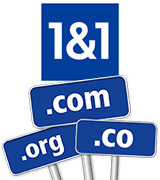 1&1 Domains is the perfect choice for those customers that aren't interested in being regular and boring and are looking to acquire the most outstanding and peculiar domain name but do not wish to skimp on the important stuff either. 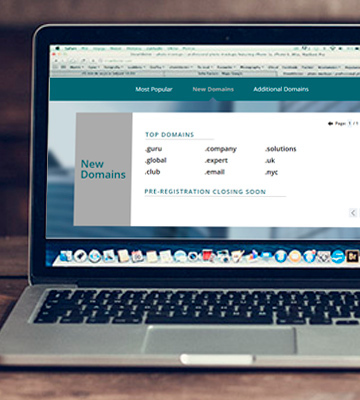 Network Solutions Get the domain name you always wanted. 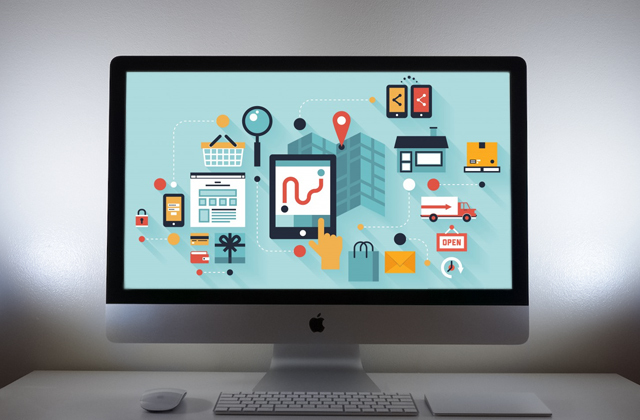 If you're looking for a place that won't just allow you to register a domain name or pick up an appropriate domain extension but will also help you host, create and design your own website, Network Solutions is going to prove itself invaluable to you. 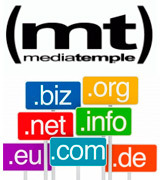 if you're in need of a website that would allow you to never be in a situation where you have to deal with any issues regarding your domain and hosting activities alone, Media Temple is one of the best choices on the market thanks to their award-winning 24/7 support and their one-stop web support center. Say, you need to send your client an attachment over certain size and your mail says no-no, use a drive or break the file into parts. What about the need to clean old-ish but still necessary messages because the space is running out? Have you encountered any of these issues? Downloading archives is a tedious and tricky process. 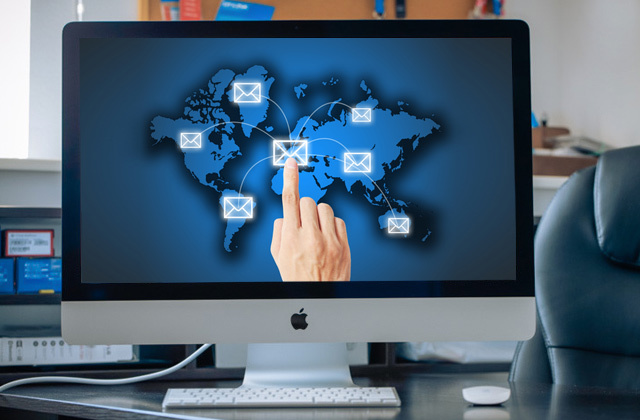 With a professional email hosting, years will pass before you need to do any of this. 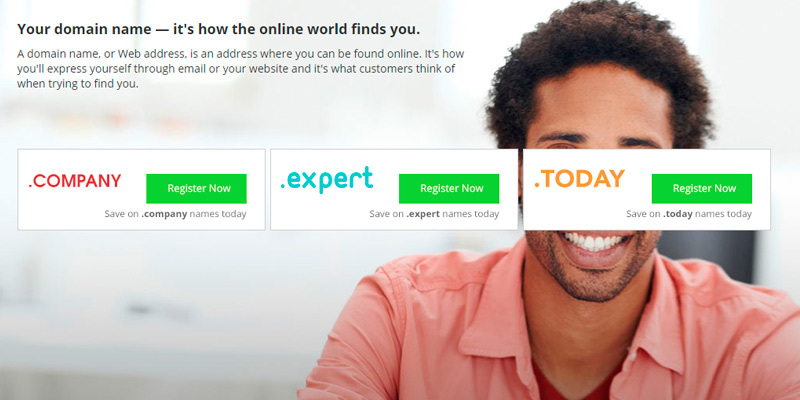 Plus, you'll get a domain-based address. It's a win-win. 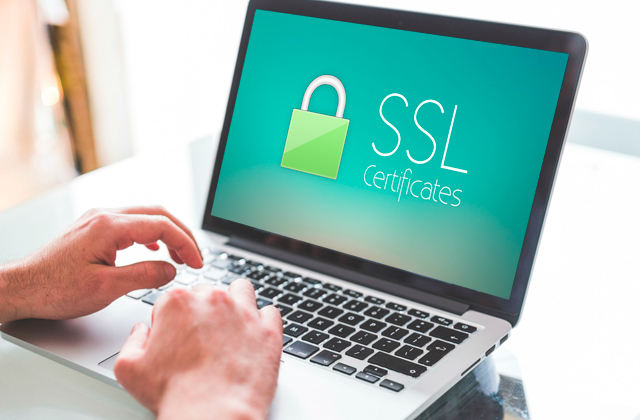 If you would like to secure access to your website, including potential credit card transactions, data transfer, and logins, there's no better way to do it than to acquire an SSL certificate. If you pay particular attention to protecting yourself from hackers, data theft, and other online threats, you definitely need to secure your Internet connection by using a VPN. This service makes all your sent and received data encrypted and secured from anyone, be it hackers or government. 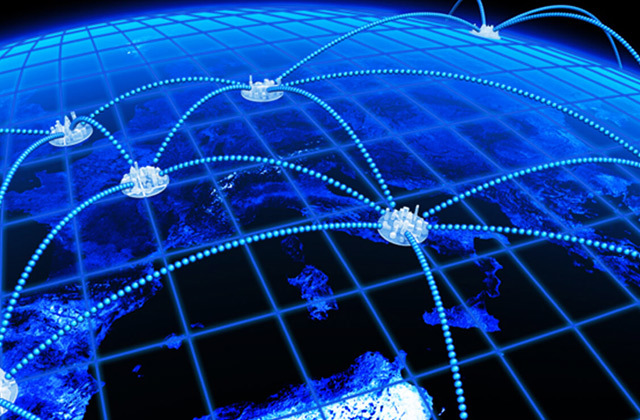 Just scroll down and select the right VPN service for your needs! Should you need a website for a small business, online store, your own blog or portfolio, a website builder will let you realize your project and make it success. Don't wait for the better days to come. You can afford to launch your website today! Although computers have become an integral part of our day to day life, not everybody can boast the same amount of experience with computers in general and with the Internet in particular. Surely, some people could honestly describe themselves as experienced users capable of tackling a large variety of issues and challenges that come with operating the computer that features an internet connection. But the entire process of developing your own website, maintaining its structure and, last but not least, registering a domain name is a task that very few could brag about successfully dealing with, regardless of their experience. From understanding the rules and procedures of the Domain Name System to the difference between levels and the hierarchy of labels in a fully qualified domain name. None of it is simple and rarely comes easy to even the most tech-savvy users and some aspects of it are downright impossible to handle without outside help. If you wish to change your website's title from an unremarkable set of numbers that signifies its IP address to a cool and catchy name, you will have to employ the services of a domain name registrar. Luckily for you, GoDaddy is not only the service that will lend you a helping hand guiding through the process of registering a domain name, but also a website that provides an incredible variety of additional content and options that are going to prove useful when it comes to every potential domain-related matter. There a lot of domain name registrars out there, so you might wonder whether this is the website that you ought to delegate handling your domain-related issues. Well, that is not a question that comes to mind to over 17 million people, since that is the number of GoDaddy customers that are willing to trust this company with their domains and there's a good chance all of these people are in the right. The website offers a straightforward and understandable domain set up that does not require their users to have a large arsenal of technical skills under their belt and it offers quick and simple instruments to forward your domains to any existing website. The company also features more than 60 million domains under their management, meaning they might have more experience than the majority of their competition. 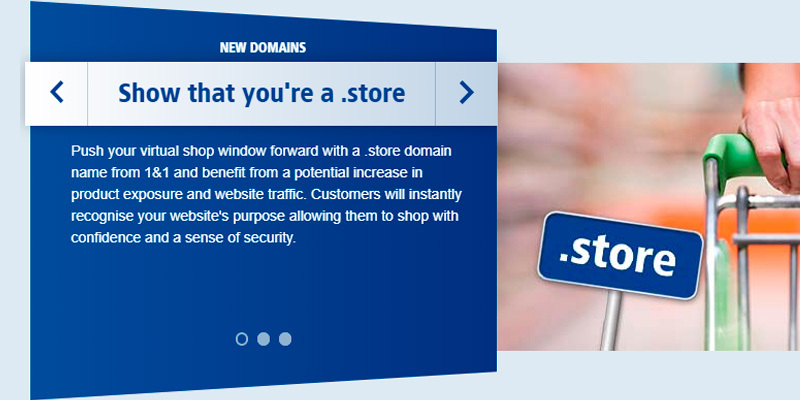 GoDaddy will absolutely ensure that you find the appropriate domain and that it's got a safe and secure home online. 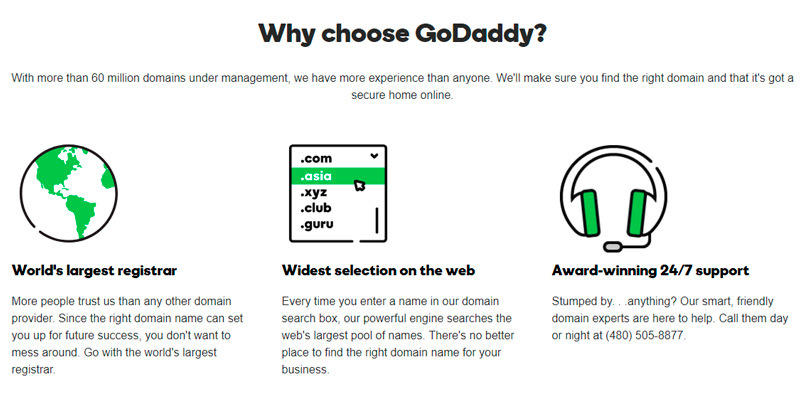 You may have simply wanted to purchase a domain name for yourself, but GoDaddy always like to go the extra mile for their customers which is why you will also receive up to 100 subdomains (like info.yourawesomewebsite.com) to customize your site and 100 professional email aliases (like sales@yourawesomewebsite.com) for you, your friends and employees. Part of their service is also a real-time monitoring option to ensure that your website is always up and running. The moment you register a domain with GoDaddy or any other similar service, your personal information is out there in the open in a public directory. 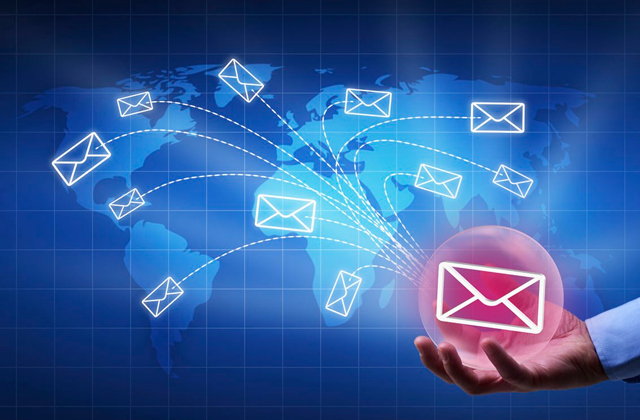 Hackers and spammers tend to use this directory to compile email lists and steal domains. 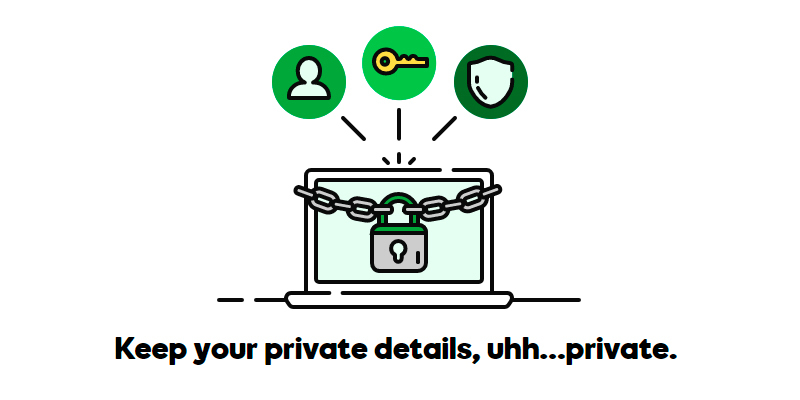 If you do not wish to deal with the consequences of that, GoDaddy features Privacy Protection option that replaces your name and contact details with their partner company's, Domains By Proxy. No one will ever be able to witness your name, address, email or phone number but them. 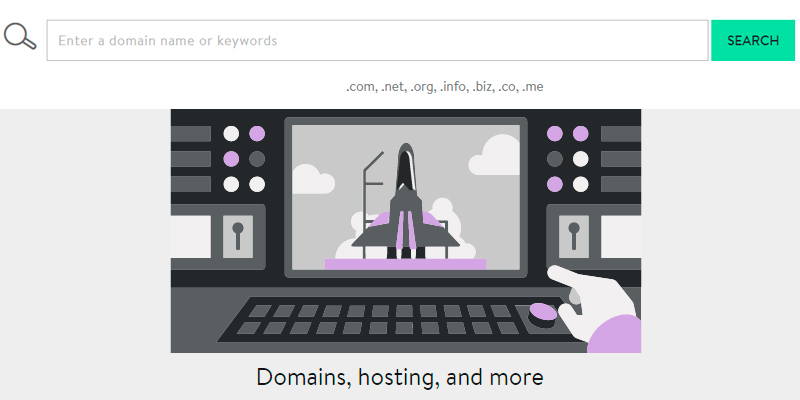 GoDaddy is one of the more simple and reliable domain name registrars on the market, but if you still happen to encounter any type of issue, their website features a 24/7 online support with smart and friendly domain experts always ready to help. So if you want a domain name registrar that won't just offer the most basic customs but provide you with an array of helpful additional features, GoDaddy is the kind of company that will definitely catch your attention. 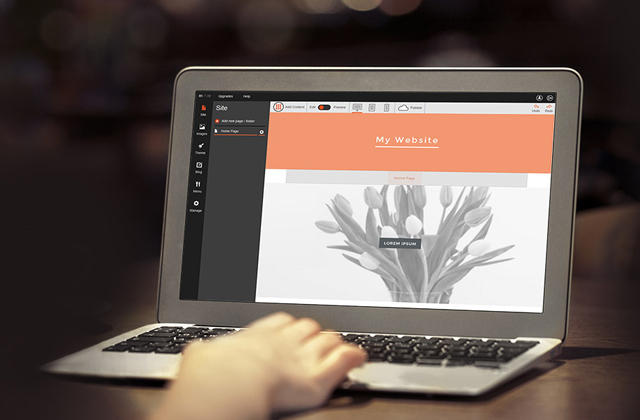 The idea of creating your own website is the one that very few could honestly describe as unparalleled and unprecedented. Since most people nowadays tend to browse a variety of different websites on the Internet every single day, there's a good chance that the notion of starting their very own site may come to mind to a solid chunk of these groups of individuals every once in a while. And since everyone's browsing history may be somewhat or entirely dissimilar, different people draw inspiration for their website from different sources. Some may want to create a new social media website after spending some time on Facebook or Twitter, having to deal with all the shortcomings these popular platforms inevitably tend to feature. Others decide to create a place for people to share their unique talents with the world or discuss even the most unpopular and controversial subjects after encountering some unpleasant opposition from Youtube or Reddit administration. Last but not least, some may simply want to find single-minded people and provide a platform for them to share the passion for their favorite hobby, be it Star Wars, electric guitars, motorcycles or sports. Whatever place may have served as an inspiration for this new venture of yours, after you're done with the development and designing part of the deal, you're going to have to register a domain name for your website, since nobody will be interested in visiting a site with a bunch of numbers in its title. 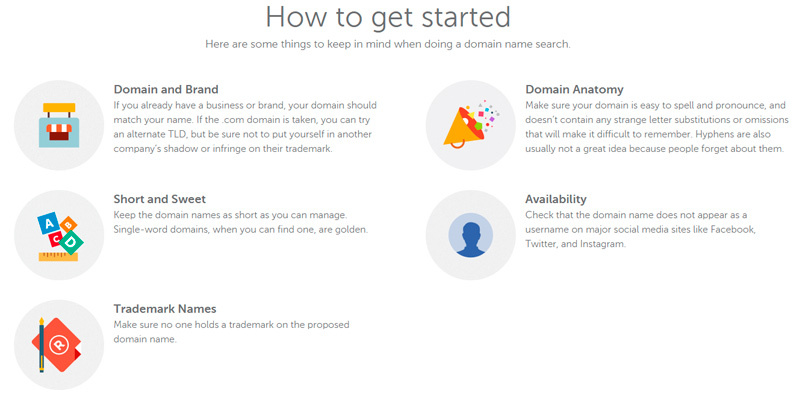 No need to get discouraged, though, since Namecheap is a domain name registrar that will easily do that job for you. 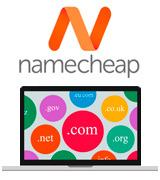 Domain registration at Namecheap is inexpensive, as you would expect from a company with a name like that, but the website didn't manage to build a name for itself just by offering the absolute cheapest deals on the market. 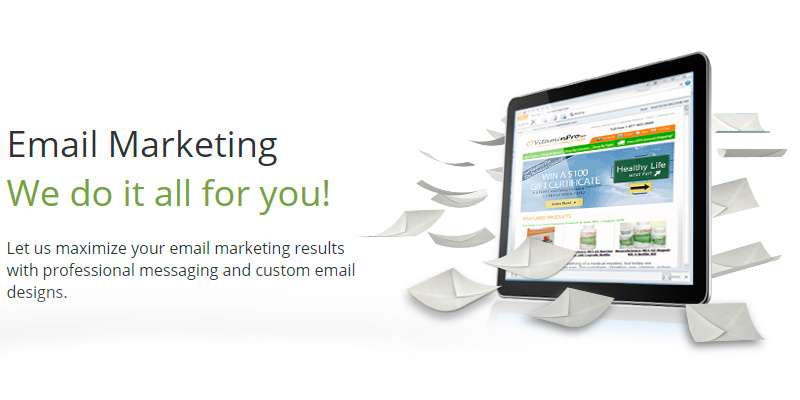 Namecheap’s reputation rests upon the proverbial shoulders of outstanding customer service and value-added packages. The service allows you to choose a domain name in case you haven't already figured out the one you wish to go with. All you have to do after that is search through the available options and purchase it with just one simple click of a button. If you happen to already have a domain name, you have the choice of transferring it to them. 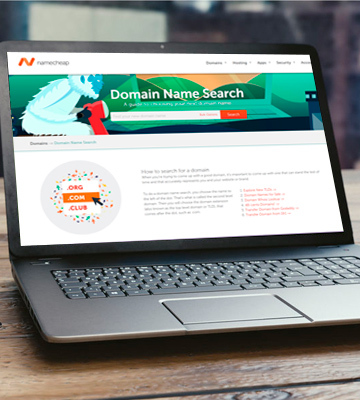 Of course, you may wonder if Namecheap is exactly the right place for you to transfer your domain and whether you should go with them instead of a plethora of seemingly comparable domain name registrars. Well, here are a few reasons that could persuade you in favor of making the right choice. If you look at the majority of their competition, most domain name registrars tend to charge thirty percent or more on renewals for important top-level domains like dot com or dot net. If you decide to go with Namecheap instead, you will be able to save a noticeable sum of money every year. A solid part of their adversaries in this particular market also tends to obligate you to publicly register your personal information with every single domain. Namecheap, on the other hand, provides their customers with free WhoisGuard for a year, a feature that will protect your private information from unnecessary public exposure. Their intuitive and user-friendly interface will make sure that you can access all of the necessary information with ease without being bombarded with a barrage of useless data. Of course, a couple of things that make Namecheap stand out the most would have to be their reliability and performance features. Their company provides its customers with DNSSEC, Dynamic DNS, and Premium DNS at the price that you will be hard-pressed to find anywhere else. So instead of wasting your time and money on some other expensive and ineffective service, put your trust in Namecheap and the results will speak for themselves. Some people may think that once you're done with developing and designing your website, everything else will be a walk in the park. Although those aspects of the entire process of creating and maintaining your own website are certainly not the easiest ones, what comes after that absolutely should not be underestimated. Even a thing as seemingly simple and uncomplicated as choosing the correct name for your website may present a few unexpected challenges. First of all, the name of your site should definitely be memorable and include some kind of an obvious clue as to what kind of content you're going to put on it. If you're interested in making a website about different kinds of dogs and puppies, naming it something along the lines of DereksCoolWebsite would seem somewhat counterproductive, wouldn't you think? But even though a name should hint at what your website's purpose is, going for the most straightforward and simple title isn't necessarily always the best choice either. If you're going for some sort of gaming or tech-related website, another example of Techreviews, TechRadar, TechIndustry or anything along those lines may simply not catch potential reader's attention. Not to mention the fact that the most obvious and clear-cut names generally tend to be taken. Of course, after you're done choosing an appropriate name for your website, you're going to have to select a domain name, which can be a separate issue in itself. Fortunately for you, you don't have to go through it alone and 1&1 Domains will be happy to help you with that process. Naturally, any person that has been around the Internet long enough is more than familiar with some of the more standard top-level domains like dot com that stands for commercial, dot net that implies network or dot org that means an organization. 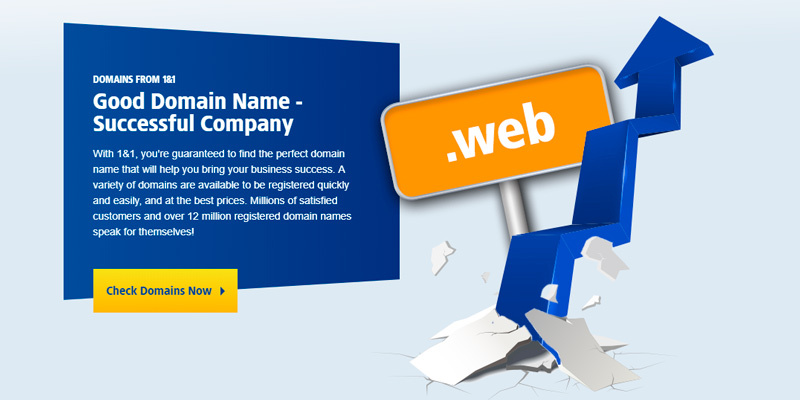 But little do some people know that you're not necessarily tied to these plain and old domain names and registrars like 1and1 Domains offer a variety of fun domain extensions that will bring some life to the name of your website. Speaking of fun, dot fun is an option as well, being a great choice for those that are planning a website aimed at entertainment or organization of events and parties. If you're interested in opening up a website for your boutique and a boring extension like dot com doesn't necessarily suit your style, you can choose to go with dot store instead. Dot club and dot hospital are rather self-explanatory and will prove extremely useful if your domain name doesn't necessarily specify the type of service that you provide on its own. As important as choosing the right name for your website and the preferred top-level domain can be, in order to be considered an excellent domain name registrar, you will have to provide a number of additional options and functions to be able to compete with your competition. People behind 1&1 Domains are more than aware of that which is why they offer a plethora of useful features for their potential customers. With every single domain extension, you get an unlimited number of subdomains that are going to prove extremely useful when it comes to segregating the contents of your website. On top of that, you get one email account with 2 gigabytes of mailbox space and unlimited email forwarding. For each separate domain acquired, you will receive a free SSL certificate. 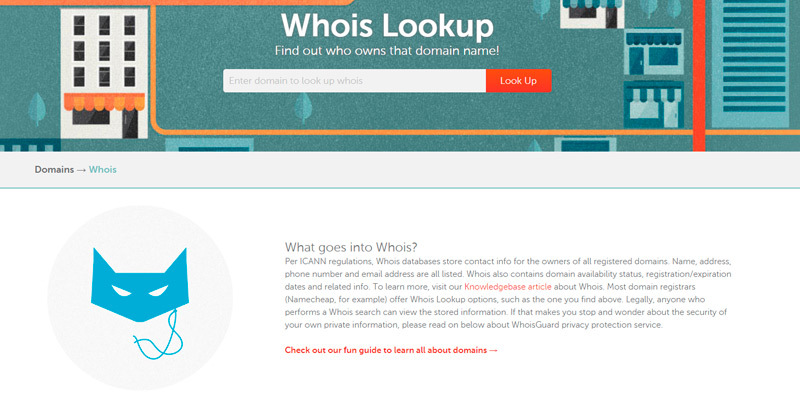 The protection of your private information is one of the most important aspects of domain registry, which is why 1&1 Domains standard package includes Whois privacy in order to secure your personal information and domain lock to protect your domain from potential hijacking case. All in all, 1&1 Domains is the perfect choice for those customers that are looking to acquire the most outstanding and peculiar domain name but do not wish to skimp on the important stuff either. If you know a thing or two about starting your own website, then you're likely aware that the very first thing you ought to do before virtually anything else is to get yourself a proper domain name. A domain name, as you should probably know by now, is the title that you would like to give to your website and the name that everybody is going to refer to it with. In order to do that, you are going to have to pay an annual fee to a registrar for the right to use the name that you have chosen. Of course, this is just a start and getting a name doesn't magically grant you a complete website ready for exploitation. What you have so far is no more than a name. After that, you will have to choose a web host and sign up for an account. 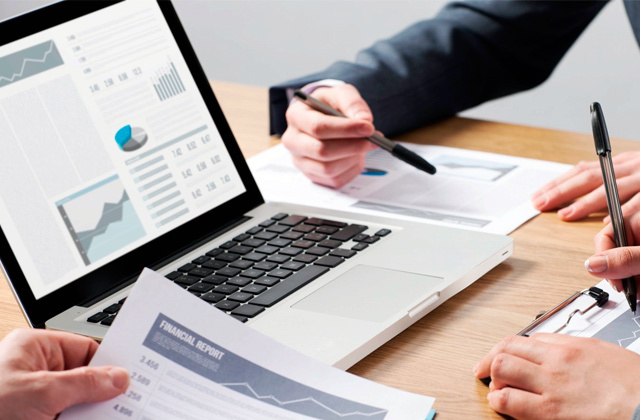 A web host is essentially a company normally presented through a website that features a variety of different computers connected to the Internet. When you put your web pages on their computers, everyone in the entire world will be able to connect to it and view them. You will have to sign up for an account with a web host so that your website would have a proverbial home. You will have to do all of that even before thinking about designing your web pages and writing the code for your website. It goes without saying that the entire process could not be described as easy and uncomplicated, but reserve your right to panic for later since Network Solutions is the kind of website that won't just provide you with a domain name but can also help you create your own website, host it and even build the whole thing for you. Network Solutions is a powerhouse of a company when it comes to everything related to domains, hosting, and websites in general. You can purchase some of the most popular and orthodox domain extensions like dot com, dot info, and dot org or you can opt to a newer and more exciting option such as dot guru, dot club or dot expert. You have also the ability to transfer your domain name from the company that maintains your domain registration to Network Solutions. All you will have to do is enter the name (or names) of the domain that you wish to transfer, choose the appropriate payment option and checkout, and authorize in order to accept the aforementioned transfer. The reasons people tend to choose to transfer their domains to Network Solutions include but not limited to DNS Management option that incredibly simplifies operating the domain name servers and DNS records online providing you with an ability to add new hosts to the domain, change IP addresses, or modify an email delivery address, Domain Transfer Lock that restricts unauthorized domain transfers by locking your domain and an Auto Renew feature that automatically renews your domains prior to their expiration date. One of the things that make Network Solutions stand out from its competition is the number of services they're willing to provide. Aside from being a domain name registrar, this company also offers a plethora of additional functions that could prove useful to anybody interested in starting his own website. 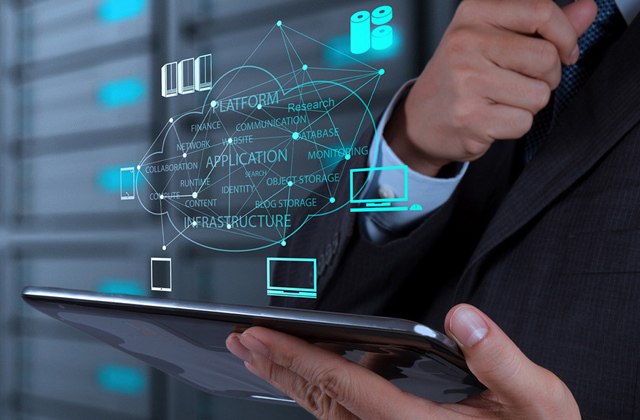 Network Solutions feature a web hosting service that allows individuals and organizations to make their website accessible via the Internet by providing space on their servers. The company also features a marketing team that will help you advertise your website with the help of Search Engine Optimization, Pay Per Click marketing, Email marketing, and local business listings. Last but not least, their website also features web design solutions in order to make your potential website accessible and enticing and an option to create your own website from scratch with their DIY guides or outsource this job to the companies' specialists. If you're looking for a place that won't just allow you to register a domain name or pick up an appropriate domain extension but will also help you host, create and design your own website, Network Solutions is going to prove itself invaluable to you. 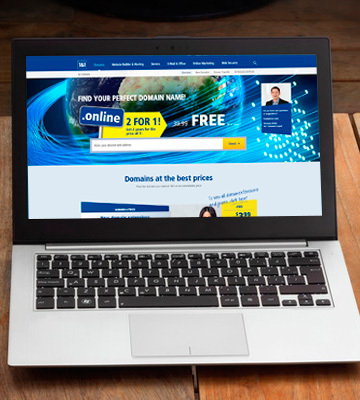 The idea of domains is about as old as the Internet itself but the business of reserving, setting up and selling internet domain names hasn't been around for as long as one might assume. But ever since United States Department of Commerce required the creation of a shared registration system that supported multiple registrars under the supervision of Internet Corporation For Assigned Names and Numbers in 1999, over 900 registrars decided to try their luck in the market for domain name registration services. And even though you probably wouldn't expect companies to particularly stand out in such a new and specific type of commercial field, certain ones manage to do just that. 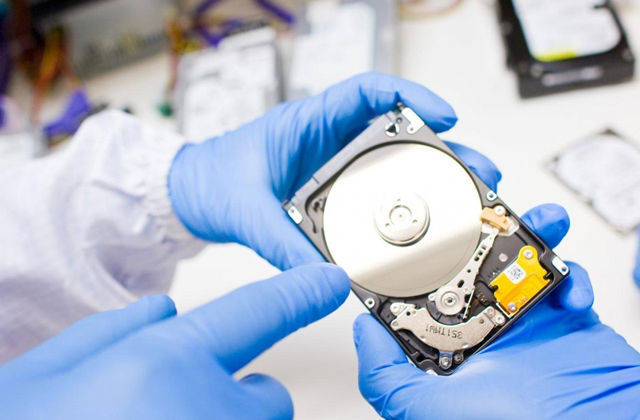 Media Temple is one of those companies that stood at the forefront of technological innovation and development and has been in the domain and hosting business ever since the year this type of service was opened to the general population. It is a volatile business and plenty of young and promising websites managed to come and go but Media Temple had withstood the test of time and still stands as one of the premier companies in this field. The like to attribute their success to their customer service first and foremost and tend to believe that their treatment of clients is one of the main reasons their web hosting and cloud services power more than 1.5 million websites in 100 different countries. Their clientele ranges from regular common folks to the most popular of bloggers and from tiny businesses to huge companies. The process of acquiring a domain name and setting it up can be rather complicated to a person unfamiliar with the entire operation which is why it is so important that the previously mentioned customer service is one of the most outstanding features of Media Temple. 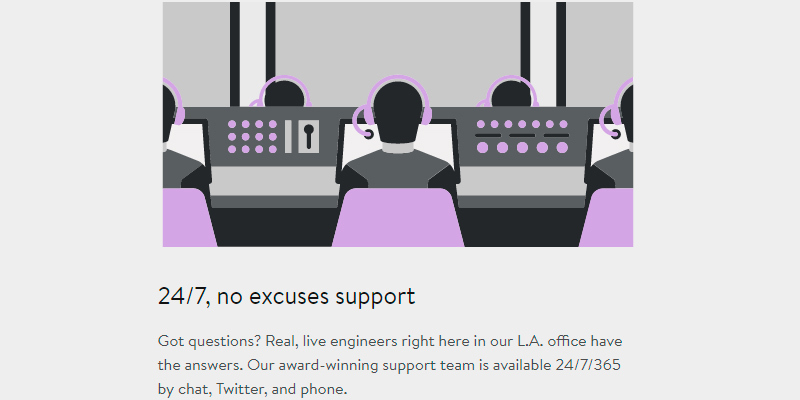 It mostly presents itself through a 24/7, no excuses award-winning support with a group of qualified engineers in their office in Los Angeles ready to answer any of your potential questions by chat, Twitter or phone. 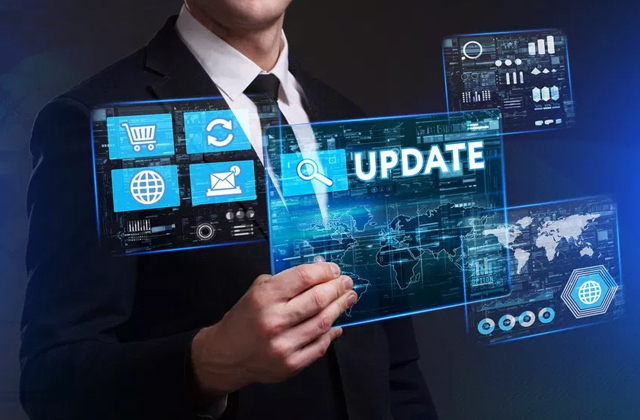 Including the standard link to a knowledge base full of useful information, their one-stop web support center stores your current and previous support tickets, service diagnostics and a system page to check the current network status. You will even be able to find a complete history of your current and past chat transcripts that could prove to be incredibly convenient if you're diagnosing intricate issues or would like to make a complaint about facing any kind of inconvenience with their support system or the website. Of course, if you're simply looking to purchase yourself a domain name, Media Temple will be able to easily lend you a helping hand with that. 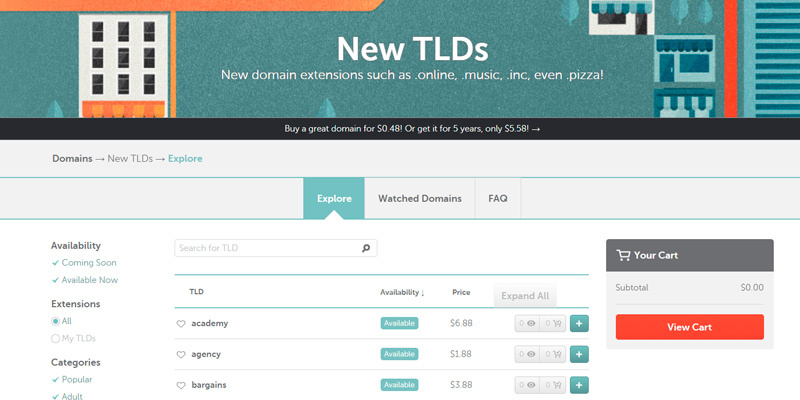 For just 5 bucks a month, you will be able to acquire any kind of domain name you want with any of the popular domain extensions. 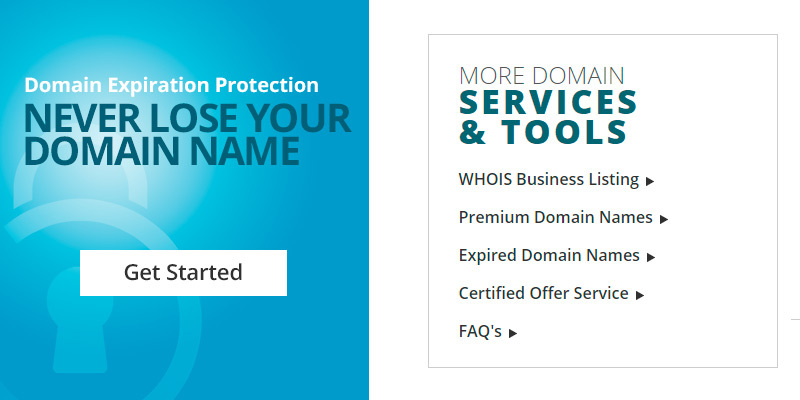 And just for additional measly $2 per your first year, you will be able to acquire additional domain privacy that will keep your name, email address, phone number or any other form of contact or personal information out of public WHOIS directory. 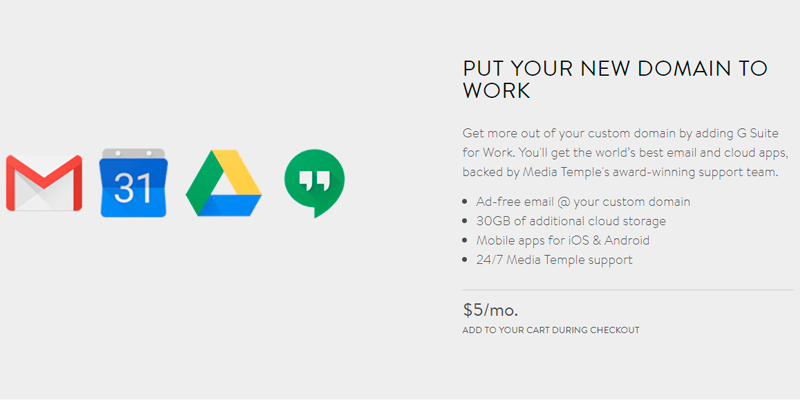 You can also instantly put your fresh domain name to work by adding a G Suite for Work. In return, you will receive an advertisement-free email at your custom domain name, 30 gigabytes of additional cloud storage and mobile apps for iOS and Android. 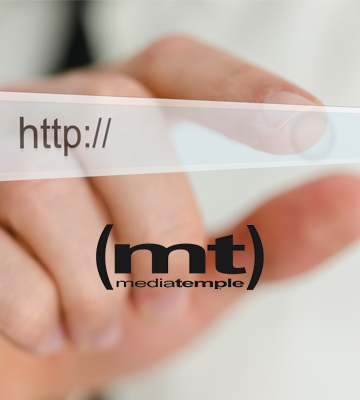 Naturally, buying a domain name is only one aspect of the process of making sure your website is up and running, so if you're looking for a place to host your site, Media Temple will prove useful in that regard as well. 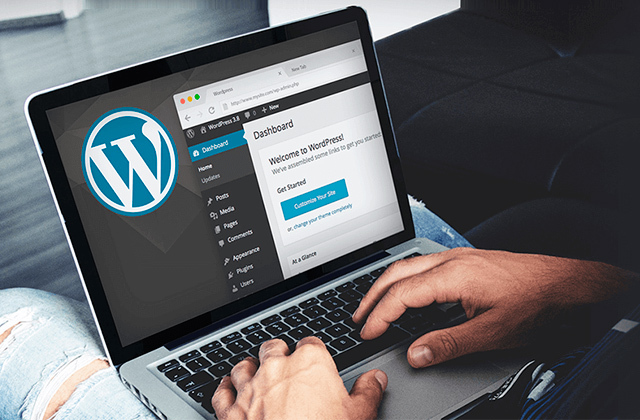 Although some may find their services to be a bit pricey, their standard package includes features that you may often find to be chargeable extras elsewhere (daily backups held for 30 days, automatic updating of WordPress and other managed apps). So if you're in need of a website that would allow you to never be in a situation where you have to deal with any issues regarding your domain and hosting activities alone, Media Temple is one of the best choices on the market thanks to their award-winning 24/7 support and their one-stop web support center. It's been years since an internet connection has turned from a luxury that a few were able to own and operate to an absolute prerequisite that is necessary in order to maintain a proper lifestyle in the current society. Hundreds of millions of people browse the most popular websites like Youtube, Facebook, Twitter or Instagram every single day and it comes as no surprise that some of them tend to decide to create a website of their own. Some parts of this process like designing the aforementioned website or paying for its hosting are relatively known to the general population but other aspects may elude the majority of potential site owners and operators. One of these aspects is the registry of a domain name that requires the service of a domain name registrar, an organization or commercial entity that manages the reservation of internet domain names. A domain name is a process that turns a raw IP address like 254.145.78.11 into a more accessible and convenient title like BestAdvisor.com.